What’s the Difference Between Hardboard, Masonite, MDF, and Plywood? The Disadvantages of Painting on Hardboard? Where Do I Get Hardboard? What If My Board Warps After Painting? Canvas is perceived by many people to be the best support for painting, but hardboard (or wood) should not be shunned. In fact, some would argue that it is a superior support to canvas for oils because, unlike canvas which is flexible, wood is rigid and this helps to prevent cracks in the oil paint. Many of the oil paintings that have survived the best from previous centuries are painted on wood panels. Acrylic paint is very flexible when dry, so the rigidity of the support is not as significant a factor. However, hardwood is also a good support for acrylics. Hardboard is the term used for a board or panel made from a hardwood such as oak, cedar, birch, walnut, or mahogany. Softwoods like pine are not suitable for painting because they contain excess resins and they tend to crack. These terms tend to be used interchangeably when people talk about painting on a board or wood panel rather than canvas. Masonite is often used as a painting support. It is a trademarked brand name of a particular type of board. It is made (in very basic terms) from wood fibers and glue (resin) that is molded into flat boards. High-grade or furniture plywood makes a good painting support. Extremely smooth plywood is made from birch, mahogany, and poplar. Hollow core door is another painting surface to consider, and it makes a relatively light panel. Laminated board has a mica film on its surface to give it resistance and strength. Check to see which side sands better and use that side to paint on. Hardboard or wood can be relatively inexpensive. The surface is more rigid, so there tends to be less cracking in the painting as it dries and ages. While it is heavier, if you are doing work smaller than 18"x24" (45x60 cm), the weight is not much of a problem. The experience of painting on hardboard is distinctly different than that of painting on canvas, and many painters prefer this. The surface is quite smooth, and the paint glides onto the surface and is easy to move around. If a board is not primed correctly, there is a risk that acid or oils may leach in from the board, yellowing the painting. Acrylic gesso is regarded as an effective barrier against this. Also, larger pieces can weigh quite a bit. They will bend or bow inward so you should take the time to add reinforcement to a frame or bracing struts (tips below). Most places that sell wood sell hardboard. It generally comes in 1/8" and 1/4" thicknesses, in tempered and untempered versions. Tempered hardboard may have been manufactured with oil to keep it from warping when wet so it can leach oil through the gesso. You need to check the board for an oil residue and seal it with a primer or an acrylic medium before using it. Untempered hardboard is looser and more fibrous and makes a good surface for painting because of its absorbency. Hardboard is easy to cut to the size you want using a saw, particularly an electric circular saw. If you plan ahead, you can get a number of panels from a single large board and have a variety of sizes to paint on. Tip: No saw? The lumber yard you buy the board from will likely offer a cutting service, too. There is typically a smooth side and a side with a weave-like finish which is very coarse. You can paint on either side; it's a matter of personal preference. If you choose the shiny side, it should be lightly sanded, so the primer adheres properly. It is generally recommended that you give hardboard three coats of gesso and a light sanding between each coat. It can produce a surface with the texture of paper or one that's as smooth as glass. Some artists use more layers to build up a completely smooth painting surface. Others don’t sand in between layers in order to create a rougher painting surface. You can also use sanding to create areas of texture that relate to the subject of the painting. Priming the back and sides will help seal the board from moisture in the air. A proper coating of gesso is important. Paint, even when it looks opaque, is affected by what is underneath. 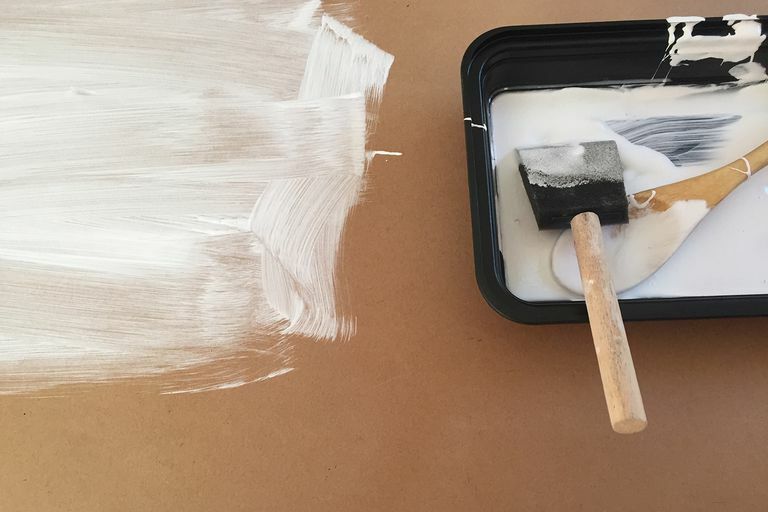 If there are at least three coats of white underneath your painting, your colors will be that much brighter. It is also an excellent way to achieve ‘light’ in your paintings. If you like the feel and look of canvas, you can combine it with hardwood to make a canvas board. It is very easy to do and gives you the texture of canvas with the rigidity of hardboard. 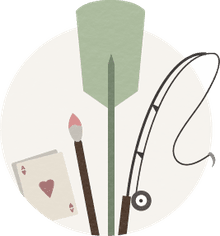 Create your own canvas board by gluing canvas or linen to Masonite using an archival-quality glue, acrylic medium, or gesso. To create the impression of a deep, ‘galley-wrap’ canvas, screw the board to a ‘frame’ at the back. Wrap and glue your canvas onto the board and fold it neatly around the edges as you would when stretching a canvas. If you are painting on hardboard over 18 inches (45.72 cm), you will want to "cradle" the panel (it's not a bad idea for smaller boards, but not necessary). This should be done prior to painting and will prevent the board from warping both while painting and over time. Cradling is, essentially, building a support frame for the back of your hardboard painting. It not only prevents warping but brings you painting away from the wall and gives you a place to attach a wire hanger. Anyone with the most basic skills in woodworking can build this support frame, and it doesn't have to look perfect because it's on the back of the painting. If you have built your own canvas stretcher or outer frame, it is a very easy project. If you don't know how to work with wood, it's a great place to begin and a skill that you'll find useful. You will find that building your own canvas and hardboard support saves money as well. To build the support frame, you will need 1"x2" boards, wood glue, nails or screws, and basic tools like a hammer or screw gun and a saw. There are many instructional videos on YouTube that will show you step by step instructions for the build. If you did not cradle your hardboard and your painting begins to warp, all is not lost. You do need to be careful when fixing it and there are a few things you can try. Paint the back of the board (if it's not already) with an acrylic house paint. Artist Brian Rice has used this to salvage a 16'x20" warped board. He says that "the water-based paint fixed the warp, straightening the board out perfectly." He has also used an oil-based polyurethane. Add a frame to the painting that wraps around the front of the board. Add a few support braces along the back side to secure the painting to the frame and counteract the bow.